The Berkey Light Filtration System provides reliable, user friendly, powerful yet economical water purification while enhancing the ambience of any environment. Each system comes complete with a base. The Berkey Light system is designed for use during travel, outdoor activities and during unexpected emergencies. This powerful system purifies both treated water and untreated raw water from such sources as remote lakes, streams, stagnant ponds and water supplies in foreign countries, where regulations may be substandard at best. Perfect for outdoor activities and a must in hostile environments where electricity, water pressure or treated water may not be available. The shatter resistant and virtually unbreakable Berkey Light system is made of a high impact strength, non BPA copolyester. 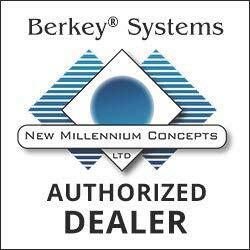 The Berkey Light system does not leach foul tasting plasticizers into your water and will not retain foul tastes and odors from waterborne contaminants. As the system purifies water, it produces the delightful and relaxing sound of falling raindrops. The Doulton / British Berkefeld Super Sterasyl self-sterilizing and re-cleanable purification elements purify water by removing pathogenic bacteria, cysts and parasites entirely. This system has a storage capacity of about 2.75 gallons and when in use it stands 26.5 in height with a diameter of 9. The system stands 21 when used without the base (included). Configured with Four 7” filters, the system can purify over 1 Gallon per hour. Not yet available in Iowa.